This originally appeared in the January/February issue of Northern Gardener. In Five-Plant Gardens, 52 Ways to Grow a Perennial Garden with Just Five Plants, Nancy Ondra outlines an approach for creating new gardens or revamping existing ones. Much like a great cookbook, it’s a wonderful concept—simple and yet almost infinitely variable—and it’s not just for beginners. Ondra explains her approach and describes the techniques she uses. Whether you’re starting fresh, looking for an easy project or refreshing an old garden, she offers a simple way to get started. Note: She clearly doesn’t expect you to read this from start to finish, so don’t. The same techniques and ideas are used throughout. The opening section gives basic information about planning and preparing for a perennial garden. She offers useful advice on selecting plants based on what you have or want and then successfully getting them into the ground and growing. Then, she launches into her recipes for 52 different gardens. The garden plans are divided into sections entitled Full Sun to Partial Shade and Partial to Full Shade, and Ondra further delineates the plans by color, area or fragrance. Each garden recipe includes a shopping list, a planting plan, what you can expect to see in each season and what maintenance you will need to do then, and how to expand or extend the garden. The recipes have clear directions and good diagrams, but a photo or two of an actual garden would have been welcome. She also offers alternative plants so you can make her plan your own. 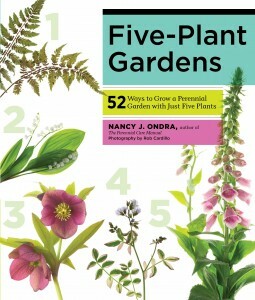 Five Plant Gardens will be published in March.